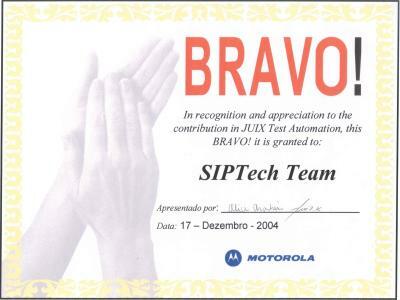 SIPTECH test engineers share responsibility of testing of a particular component with the Motorola test engineers, and interact with our test leads. As the teams are dispersed geographically we have found that frequent communication contributes to the success of the project. In this pursuit, we have weekly phone conferences, for a particular component of the architecture, between the SIPTECH onsite test engineers, the Motorola test engineers, the SIPTECH engineers located in Chennai, and the Motorola product development engineers. In addition to these weekly phone conferences are daily communications using the telephone, emails or Instant Messaging. Having used large offshore vendors for past 10 years we have chosen SIPTECH for their responsiveness, flexibility and ability to quickly ramp resources for the period. Although still in early stages of project engagement, SIPTECH has made significant contributions in meeting client commitments. We have contracted with SIPTECH to help develop a groupware, messaging, and collaboration product that interfaces with Microsoft's outlook product. This relationship was started approximately 4 years ago and continues today. SIPTECH, with their extensive Java and J2EE knowledge, has contributed significantly to meeting the goals of the project. In the latest release of Zaplet, SIPTECH engineers led the design and implementation of the key feature such as X.509 and digital signatures.